OK, so now we have collected all this information about our painting, where it will hopefully be sold and how it is to be promoted (usually along with a lot of other competing works). So what price do we set for our artwork for sale? I have heard advice like you take the cost of the frame and triple it, or you measure the outside dimensions of the frame in inches and sell it for that price in dollars. All of these solutions are not very useful if you intend to be successfully selling paintings for a very long time. If you had some Picasso artwork for sale you can quickly see how inappropriate this formula would be. For a start the cost of your frames will hopefully go up at a slower rate than your artwork. So why fix your pricing to someone else’s product – your framer! And the size of your work may not relate to how much work you have put into it. Artwork for sale – sold! Now the way to set a price for your work is to appraise it truthfully as to its quality, compare it to similar work that has sold before, in the area you will be selling it in. When you first start, as you will not be known for your work, you may need to set a lower price than you would like, but you can easily adjust your prices, once your sales begin. I keep a record of every painting I sell, along with its price, place, who bought it (if I can find out), its subject and size along with any other information I think may be of use in the future e.g. why was it bought, by a collector, for a gift, for decoration or because the person really connected with the painting? 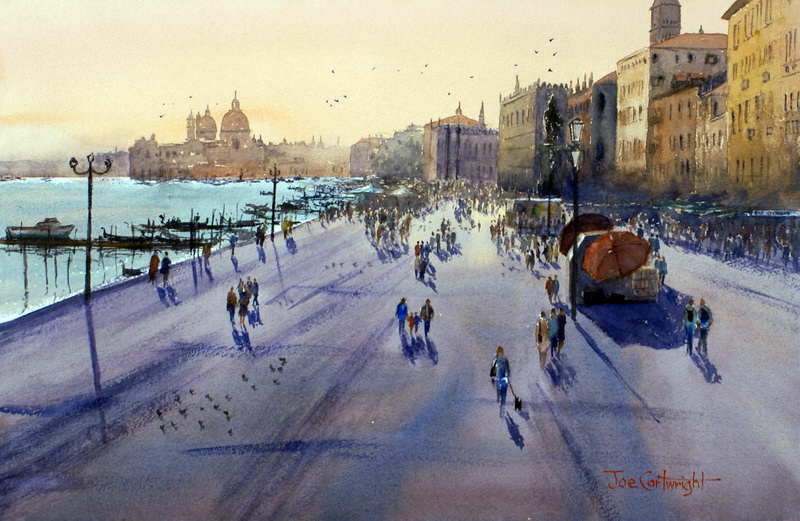 I sell a lot of paintings of Venice to people who have been there but did not pick up a souvenir painting while they were visiting. I also have sold a lot of paintings to people who have purchased my watercolor paintings from me before. Remember, people will not pay you what you think or would like your painting to be worth. They will pay you what they think it is worth to them. Their idea of what it is worth is based on their desire for the painting (how have they connected to it), what price have they seen on your sold pieces before, what prices similar works by other artists have sold for, and how much money do they have? This last one is quite pertinent. If your local or national economy is having a hard time, unfortunately, art and painting are one of the early things people cut out of their budgets. So don’t expect the price of your work will only continue to go up. You can keep your work going up or at least staying the same if you are ready to sell less, or sell better paintings for the old price or if you do more promotion to a wider audience (this is where the internet can help). Otherwise you may need to bring your prices down in tough times and take them up in the good. This is what retailers and real estate agents do! The same applies to artwork for sale. If you do your homework as above, and set realistic prices you are in a very good state to sell your work. In time, from your records of your own sales you will have a better idea of what price to put on your work. My own policy is to leave my customers feeling like they got a good deal. Don’t be greedy but don’t give your work away. I have known artists who have sold their work for little more than the price of a frame. This surely cannot leave you with a good feeling. Remember “Artwork for sale” should mean you are “selling” something for a profit! As an established selling artist, you should have plenty of records showing what prices paintings of particular sizes sell for and where. This information has become the main tool I now use for pricing my work. My prices are now set against artwork I have already sold and rarely based on what other people are selling their artwork for. But it does take some time and quite a few sales to get to this stage. Now, if you are one of the lucky (hard-working) few who become very popular (their work is in great demand) and if you cannot paint enough to supply that demand, then you are able to raise your prices accordingly. This is how it works in other industries such as real estate. “Artwork for sale” also conforms to the laws of supply and demand. The higher the demand and rarity the higher the price! I hope this article has been of some use to you with your efforts to sell your own artwork.